Jockey Natalie Turner has been suspended 30 days for her role in a mid-race altercation at Oklahoma's Will Rogers Downs May 21. 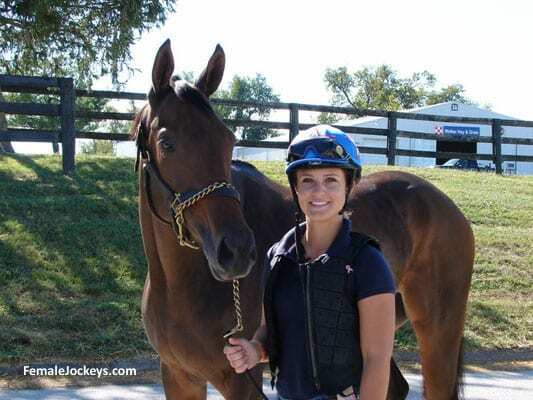 Stewards ruled this week that Turner “intentionally and deliberately struck at another rider with her crop, endangering other riders and horses during the final 1/8 of a mile.” In addition to the suspension, Turner was ordered to attend an anger management class. The other jockey, Freddy Jose Manrrique-Guerrero, was given the same order and suspension when his penalty was handed down May 25. Replays of the 12th race from May 21 (below) show that Manrrique-Guerrero made intentional contact with Turner more than once coming off the far turn. Moments later, with the riders side-by-side in close quarters, Turner flailed her whip at Manrrique-Guerrero three times. Both jockeys are set to begin serving their suspensions June 9. This entry was posted in People, Videos and tagged Freddy Jose Manrrique-Guerrero, Horse Racing, jockey altercation, jockey fight, jockey suspensions, Jockeys, natalie turner, Oklahoma racing, stewards rulings, will rogers downs by Scott Jagow. Bookmark the permalink.